Notes: Pattern originated with Doug Swisher in Southwestern Montana during the 1980's. 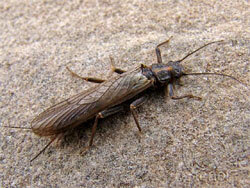 Primarily used to imitate hoppers and large stoneflies, the Madam X can also be adapted for cicada, dragonflies, crickets, and other large type insects. The original pattern was composed mostly of Elk Hair using a yellow thread ribbing. Additional colors were later incorporated into the body through the use of colored floss, Antron Dubbing, or some other type of colored dubbing. Usually the Madam X is tied with an underwing, although you will often find this step omitted, depending upon the floatation one desires and the type of insect it is mimicing. 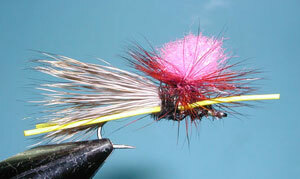 The fly floats extremely well with the heavy Elk Hair wing. 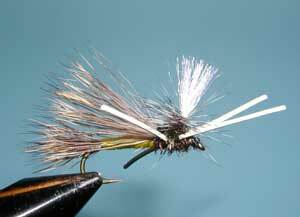 On smaller sizes, Deer Hair is often substituted and still provides sufficient floatation. 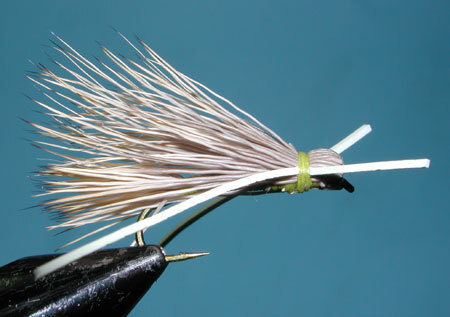 Deer Hair can also be a better choice for securing the hair to the shank. 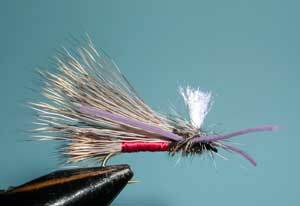 The rubber legs give the fly plenty of life-like action and can be trimmed to any size desired. The parachute adaptation to the fly provides for increased visibility. The parachute post can be Antron Yarn, Hi-Vis, or Calf Tail. Rather than using a bullethead-type wing/thorax, the parachutes are usually tied with a peacock herl thorax and a standard hair bundle wing. The wingpost is then secured in front of the wing tie-down position. 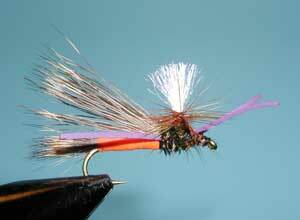 The Orange Parachute Madam X is primarily used for the large October Caddis hatch in the Sierras. Olive and Yellow colors are used for hoppers, and black for crickets. Doug Swisher has some good photo sequences on how to tie the Parachute Madam X on his website. The Hi-Vis Parachute Madam X shown below is one provided by Mike Owens for our Favorite Fly Swap of 2006.